What is the house raising process? House-raising involves separating your house from its foundation and temporarily raising it with hydraulic jacks. The actual lifting of the structure involves long steel I-beams and the aforementioned hydraulic jacks. Generally house raising can take anywhere from one week to several weeks. Each house presents its own set of challenges and issues; this is why we are happy to come and see your house and spend the time helping you understand the issues surrounding the raising of your house. Will the house be damaged by house raising? In most cases no. On rare occasions there may be small cosmetic damages to drywall, but it is not common for a house to be damaged during raising. Is my house located in a flood zone? In the wake of the devastation from Hurricane Sandy, FEMA has published an updated interactive flood zone map that can be accessed by clicking here. Will the the value of my home change if I raise it? In most cases, the value of a home (especially if located in a flood area) will increase after being raised. 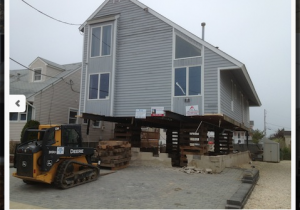 Can I live in the house when it is being lifted? No. It is not advisable to be in your home during the raising process. Can I receive an estimate for my house raising? Absolutely, call us at (732) 275-4960 and we will schedule a consultation.